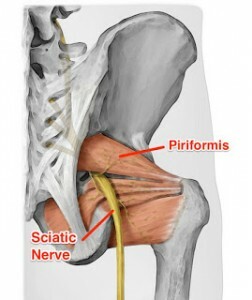 The Piriformis muscle is an external rotator of the hip joint and also a stabiliser of the sacroiliac joint. When this muscle goes into spasm, it is called Piriformis Syndrome and can cause pain in the buttock and occasionally neurological symptoms into the leg (sciatica) as the sciatic nerve is in close proximity to the muscle. Most commonly, the causes of Piriformis Syndrome are due to external factors causing muscle spasm, such as overuse in sport or direct trauma. Altered biomechanics is also a key factor in causing Piriformis Syndrome, this is most commonly seen when there is pain on one side of the body, causing an antalgic posture or gait (standing/walking differently to avoid pain), which can then overload the piriformis muscle on the good side. Another common cause of Piriformis Syndrome is regular microtrauma such as direct compression, this can happen if you keep a wallet or a phone in a back pocket of jeans and sit on it frequently. This is where the term Wallet Neuritis comes from! There are several ways to help yourself if you’re suffering with Piriformis Syndrome, sitting on a spiky ball is a great way to help alleviate the pain and the contraction of the muscle- this works as a type of self massage technique. The Pigeon Pose in yoga is also a great way to help stretch out the piriformis muscle (see link at bottom for guide and more info). However, if you’re unable to get relief from stretching or self massage, the massage therapists and Osteopaths at the Vale Practice are trained to assess the problem and to provide advice and treatment to help get you moving!